“Hang on, this is our show”: That’s what (from left) Minister Dale Wakefield, Mayor Damien Ryan and Chief Minister Michael Gunner seem to be saying at the site for the palliative care hospice yesterday, as Sandra Clyne, Lesley Reilly and Mary Miles are overjoyed with the success of their long campaign for the facility. A media opportunity with government VIPs in the foreground yesterday turned into a celebration for three women heading up a 22 year long battle for specialist palliative care services in Central Australia. It was the Chief Minister applauding Sandra Clyne, Lesley Reilly and Mary Miles, of the NT Hospice and Palliative Care Association, when he visited the construction site of a 10 bed hospice yesterday. It is jointly funded by the Commonwealth ($5.3m) and Northern Territory Government ($1m). 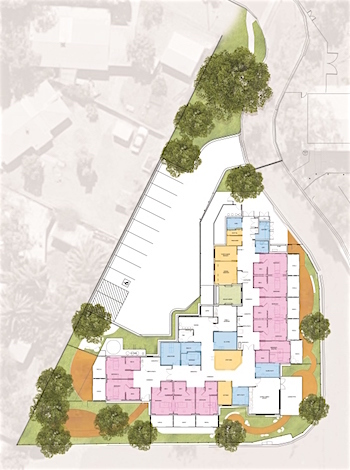 Located at the rear of the hospital, it will provide a home-like environment, with bedrooms leading to outdoor courtyards and a large communal lounge area and meeting rooms. The national association, which now has 15 local members, more than two decades ago managed to have the government appoint a single nurse, and a doctor for one day a week, to provide specialist services for the dying. The services grew over the years and MLA for Araluen Robyn Lambley secured funding for the hospice when she was the Giles Government’s Health Minister. The funds were threatened to be diverted to a multi-purpose centre, mixing palliative care patients with long-stay rehabilitation or elderly patients awaiting nursing home placement. The association swung into top gear, lobbying the Government and the Opposition Leader at the time, Michael Gunner, who made the issue part of his election platform. Yesterday he made good on his promise. Ms Miles says the facility’s services will range from symptom control to end of life care, and will be run entirely from the new building. At present, part of the service is accommodated in an office in the Mall. Sandra Clyne: If the palliative care unit is engaged in practices that they absolutely cannot talk about then perhaps consideration should be given to either opening them to public discussion or discontinuing them. To remain silent can only damage public perception of palliative care. In my opinion the continued silence from the Palliative Care Association is disturbing. Surely the Chief Minister should also be concerned and encouraging the association to make a public statement. After all the hospice is jointly funded by the Commonwealth ($5.3m) and Northern Territory Government ($1m). Surely there are standards of openness, transparency, consent, rights of patients and relatives and legalities incumbent on all organisations and especially when we fund them. The Palliative Care Association needs to generate a comprehensive and clear public statement that will reassure Territorians. In my opinion if they cannot or will not do that then the Chief Minister must order an enquiry. @ Evelyn. Looks like we won’t be getting a response from the Palliative Care Association. The problem I have with the palliative treatment my father received in a nursing home in Adelaide is he may have suffered unnecessarily by being deliberately dehydrated for several days before his death. He could have been in great pain but unable to cry out because of the effects of dehydration on the elderly combined with morphine. His was certainly not a quick death, the process lasted several days. My strong preference would have been for him to be cared for until he died naturally, with pain killers and sedatives administered as needed. That’s the manner of death that I believe is dignified. To achieve that for him I would have needed to see through the facade of a feeble, semi-conscious old man attended to by palliative care workers, with soft music playing and a picture of my mother at the foot of his bed. Thank you Anon for the good explanation of the three points. I hope a spokesperson from the services will come to answer. @ Evelyne. There are three ways to die in a palliative hospice. • A natural death, caring palliative care workers ease the pain and provide counselling and the patient passes away, as you say, with dignity. • A morphine overdose. Patient in severe pain so painkillers are administered until the pain is gone, death could be by overdose or natural. The patient passes away in a caring environment. • Dehydration induced heart attack. Typical candidate is very old and clearly dying but slowly. The person may be lucid some days and not on others, there is no obvious pain to be relieved by morphine. The natural death is the one promoted by palliative advocates, the possibility of death by morphine overdoes to kill pain is usually discussed with relatives and accepted by them. Their loved one is dying and in severe pain, they accept a pain free death. Death by dehydration appears to be more under the radar from my experience and I note that the Palliative Care Association will not discuss it. If it doesn’t happen here they could say so and finish this discussion immediately. The treatment involves the withdrawal of all fluids, triggering dehydration which is a high risk factor for the elderly. Once dehydration sets in together with the morphine the patient quickly lapses into semi consciousness and is unable to communicate. The family see their loved one apparently asleep, with caring palliative care workers in attendance. Death by heart attack takes place within two to six days. @ Anon: Your experience with palliative care is obviously different than mine. Morphine was given for the pain and water was given up to the last breath. The dead certificate does not state “heart attack or heart failure”. My son passed away with love and dignity. @ Sandra. I’ve spent some time ferreting around the Palliative Care Australia website but can only find a lot of feel good statements. I can’t see anything on the end of life palliative treatment that I had first hand experience with and I understand is common practice. This palliative treatment is arguably illegal since dehydration with the intention of causing a heart attack is a deliberate killing, albeit the patient is dying anyway. The treatment is always recorded as a heart attack. I would think that the Palliative Care Association know all about it but can’t discuss it. For the same reason they can’t consult with relatives. At best they can use code such as referring to morphine as the “necessary drugs” rather than saying “the drugs we need to euthanise the patient”. The law is standing in the way of implementing essential procedures and safeguards around killing a dying patient. In my view palliative end of life treatment should probably cease until the law catches up and there can be informed consent and safeguards. I suggest you read the Palliative Care Australia website. @ Evelyne: The problem with a living will is that you are making a decision on treatment without a context. For example you may feel that you don’t want to be euthanised but there are diseases that may make you change your mind. Your quality of life may be so poor that an early departure may be a blessing but your relatives may be hampered by your living will. Much better to simply clarify the end of life process and options together with decision making and consent. Very unsatisfactory that the Palliative Care Associative has chosen not enlighten us, in my opinion. Everyone should have a living will, one form of advance directive, leaving instructions for treatment. It takes the burden off taking decisions by the family. The concept of an advance health directive is defined in the Powers of Attorney Act of 1998 and Guardianship and Administration Act of 2000. @ Harold. So part of the “treatment” of the terminally ill, or just plain very old, is … killing them. Perhaps I am a little fixated on this but surely it deserves to be openly and honestly discussed. Is the manner of death – withholding water for up to a week and giving morphine – humane? How much suffering does this “treatment” cause? Are there alternatives for those who prefer a quicker and less painful departure? Are relatives asked for permission prior to the treatment? When relatives place their old people in the new hospice will they be made aware that they will eventually receive the palliative treatment? Who decides which of the patients are to receive the treatment? What are the safeguards on this life or death decision? Congratulations Sandra, Mary and Lesley from Nerys and me. We are indebted to you for your long and relentless campaign to provide dignified palliative care. And we also salute Robyn Lambley, whose ongoing political presence is a huge bonus to Central Australia. Bring on the women! @ Anon: Surely palliative care involves a little bit more than just the function of ending the patient’s life. You seem a little fixated on that particular aspect of treating the terminally ill, as far as I can tell. You oppose the point made by John Bell in one sentence and then effectively prove his point in the next. @ John Bell. End life advocates and palliative care advocates are not at all at opposite ends of the debate spectrum in my opinion. I wager that far more people are sent to their graves by palliative care workers than by the end of life advocates. Personally if I was very old I’d rather end my own life quickly than suffer the agony of death by palliative care. Dehydration and a heart attack is slow and most unpleasant even if some pain is relieved by morphine. I don’t think that a palliative care worker holding my hand or sponging my lips with water would make it easier for me. But of course the method is needed to protect the palliative care workers. The palliative patient must die from natural causes. But these are just my honest opinions based on my own experience and with all the applause around the new hospice I’m hoping that my view here will be demolished by a response from the palliative care team. My heartfelt congratulations to Mary Miles and her fellow palliative care warriors in an area of end-of-life care that is at the centre of so much contentious public debate around Australia. The right to end life advocates and palliative care advocates are too often seen as opposite ends of the debate spectrum, as warring factions. Sadly, in the current human rights climate, palliative care advocates definitely have their backs to the wall; they are most unfairly stereotyped and criticised by the other side. At the end of the day, literally speaking, I often wonder how I would accept a situation of terminal illness and chronic pain were I to draw that short straw. It is a very great comfort to know that if that situation arises, people like Mary and her fellow warriors will be there to hold my hand, to help me have the courage to see Life through. Thank you, Mary, Sandra and Lesley. You are beautiful souls of compassionate care. It is terrific that you now have government support. Congratulations to the Palliative Care Association for remaining committed throughout a long process to secure this much-needed facility in Alice Springs. This is a real win for our community! It also provides the Territory Palliative Care team with a much-deserved home base from which to carry out their valuable and important work. I’m wondering if the Palliative Care Association could respond to my description of the palliative “care” my father received at the end of his life. Specifically, is death by induced heart attack on the cards for our old folk and us at the new hospice? If it is what is the level of information provided to relatives beforehand and is their consent sought? Huge congratulations to Sandra Clyne, Lesley Reilly, Mary Miles and others who have finally succeeded in their quest after 20 years in dedicated pursuit. I know Robyn Lambley MLA has also been a keen advocate for this designated hospice facility for a number of years. It will help to provide those who choose a more dignified and passionate passing. Specialist staff assisting patients and families will be of great benefit to the dying and the bereaved. We will all die at some point. It’s the manner in which we do so, where we have a choice, that’s so important. Thanks to all who have contributed to make the journey a soon to be reality. I welcome and support a home-like environment. My son after few years of suffering, and, having done a life will accordingly to NT law, decided that enough was enough, took the decision to ending all. Thanks to the Alice palliative care services, its doctor and dedicated health nurses. My son peacefully left us in his home surrounding by his loved pets and family. For those who could not depart from home, any substitute, even in hospital, is good. In 2008 I received a call from a nursing home in Adelaide where my elderly father resided. The nursing home told me that my father had been deemed palliative by a doctor. I was unclear what that meant and I had talked with him a week before. The nursing home asked if they could procure the necessary medicines. I readily agreed that he could have any medicines he needed. Two days later my son visited my father, he was in a bed with soft music playing and an assistant was sponging his lips with water. He was semi conscious and unable to speak. The staff explained that he had been given morphine (the necessary medicines) and on no account should be given a drink of water. I rang the nursing home and asked what was going on. They said he was palliative and would pass away soon. I asked them to give him water and they said if they did that they would have to start all over again. He died of a heart attack two days later and I have never been sure whether I did the right thing by going along with the euthanasia. I do wish that the nursing home had been clear with me in the first place and told me they were seeking my consent to kill him with morphine and dehydration, causing a heart attack. I understand from my local doctor that his method of death is common practice, including here in Alice Springs.